ESO’s Picture of the Week from 6 September 2010 was voted Wikimedia Picture of the Year 2010 in the fifth edition of the annual competition, that takes place on the Wikipedia Commons . The winning picture was taken by ESO Photo Ambassador Yuri Beletsky in mid-August 2010 from ESO’s Paranal Observatory in Chile, using a wide-angle lens that covers about 180 degrees of the sky. For this year’s competition more than 1500 Wikimedians cast 2463 votes for 783 photos. All entries in the contest were featured pictures on Wikimedia Commons during 2010. The winning picture, which showcases ESO’s Paranal Observatory in action, received 241 votes during the second of the two rounds of the competition. In this picture, ESO Photo Ambassador Yuri Beletsky captured the work of a group of astronomers who were observing the centre of our galaxy, the Milky Way, using the laser guide star facility on Yepun, one of the four Unit Telescopes of the Very Large Telescope (VLT). Yepun’s laser beam crosses the majestic southern sky and creates an artificial star at an altitude of 90 km high in the Earth's mesosphere. 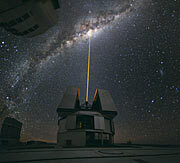 The Laser Guide Star is part of the VLT’s adaptive optics system and is used as a reference to correct the blurring effect of the atmosphere on images. ESO has recently developed a concept for compact laser guide star units, whereby small powerful lasers are combined with a telescope that launches the beam, creating a single modular unit that can be mounted directly on a large telescope. The Wikimedia Commons Picture of the Year contest is an annual volunteer-led contest, running since 2006. Wikimedia Commons editors nominate the best media for featured status in an ongoing project, and all featured pictures from the previous year are included in the annual Picture of the Year contest. The Wikimedia Commons is a media repository hosting content that anyone can share, reuse, and remix.